I had no idea mothering would come so naturally. I’m not saying that mothering is easy, because it definitely isn’t. But there’s something that happens to a woman when she becomes pregnant for the first time. An inner voice. A mother’s instinct. Something. This instinctive ability to mother seems independent of outside experience with mothering. I’ve known mothers who grew up with a great mother, mothers who grew up without a mother, mothers who grew up with terrible mothers…and it doesn’t seem to matter. We’re all here, just doing the best we can. But what happens when outside influences start analyzing our parenting choices? Have you ever had someone question your parenting? Ever had someone analyze your decisions? Ever been given unsolicited advice from a stranger? The cashier at the grocery store. The librarian. Your own mother. We aren’t living life on an island, and we can’t parent in a vacuum. 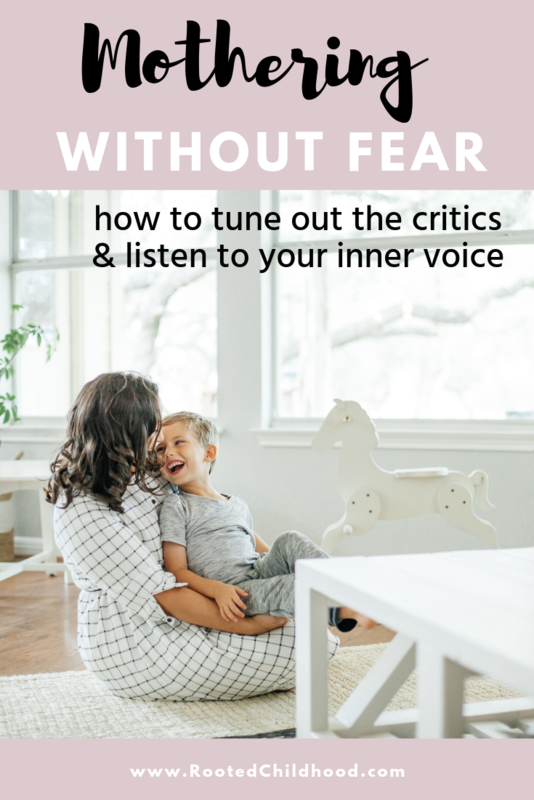 But we can learn to tune out all of those outside voices and instead, listen on our own inner voice as a reliable, trustworthy guide though this journey of motherhood. Hmmmm, I’m not sure…you just know. There’s probably science to back this up whether its hormones or the biological connection between mother and baby, but there’s definitely something. I worried after I had my son if we’d have that same bond. We were separated for weeks after his birth, and he required bottle feeding for months. Would I be able to tell when he was hungry? Yep, those maternal instincts kicked right in. We had two pre-teens live with us last summer, and I quickly learned that while tweens don’t have the physical demands of babies and toddlers, they require as much, or more, emotional support. It didn’t take long before my maternal instincts kicked in, and I was nurturing and loving these children as my own even without any biological connection. Somehow, I just knew when they needed to talk or when something was going on that they weren’t telling me about. There are many paths to motherhood and a million ways to be a good mom, but they all have one thing in common behind the scenes: a mother who loves her child. You can read all the books. You can do all the things. And it still won’t be easy. Mothering isn’t an exact science. If it was, someone could just tell us what to do to produce the desired output. But raising children is about more than the end game. I’ve got five living, breathing people under my roof. Each one of us has a distinct personality, speaks a different love language, and has different needs. The harmony in our home depends on meeting each person’s needs and finding a way for us all to co-exist in a way that serves each other’s needs as well. There is no book, no expert, no blogger, no online course, or anything in the world that knows more about your family and your situation than you. Now that we’ve established that you are the only expert that matters, can we tune out all the noise? We all love our children. But that doesn’t mean we have to give them everything, all the time. Each time I’ve been pregnant, my kids end up watching several hours of TV a day. When I launched my own business, I started staying up late to work and needing a nap during the day. On days when I’ve just had enough, I feed my kids cereal or oatmeal for dinner. None of those things make me less of a mother. I’d argue that knowing my limitations and adjusting for them makes me the very best mother I could possibly be. You know when your kids are hungry. You know when they’re ready for bed. You know when they’re ready to learn the ABCs. You know when they need to be pushed down the slide. You know when they need to hug it out. You know when they need a few minutes alone to calm down. You’re in the trenches. I trust you to make the best decision with all of the information you have at hand; do you trust yourself? I won’t let the fear of anyone else looking in on our situation impact my motherhood. I won’t let the fear of not doing enough impact my motherhood. I won’t let the fear of missing out impact my motherhood. I’m doing the best I can, and sometimes that is dance parties and bedtime stories and sometimes that is Mr. Rogers and Cheerios. And that is just fine. Instead of always striving for more, settle in to the here and now. Motherhood is a lifetime commitment, but the season of hands-on, intensive mothering is a short one. When we can embrace our inner voice, throw caution to the wind, and let go in our motherhood, we find something beautiful. It’s called childhood. And it’s there waiting for you to reclaim it, relive it, and share it with your children.